The GPSTC Rescue Tower is a 7-story building designed for practicing technical search and rescue operations, high line scenarios, stand pipe operations, aerial ladder operations, and high-rise firefighting operations. Each level of the tower incorporates various mazes and obstacle courses that typify what firefighters will encounter during interior search, rescue and extrication missions. Rappelling skills are taught in technical rescue courses both on the outside facade of the building and in an interior elevator shaft. The entire Tower is equipped with video camera surveillance and a heat monitoring system to ensure safety and provide trainees with a valuable critique of their performance. Along with live fire pods, a 3-story burn building serves as the primary prop for the structural fire control courses and allows students to practice firefighting and interior search and rescue techniques. The Burn Building is outfitted with sprinklers, which allow firefighters to learn the proper methods for fighting fires in sprinklered buildings, and is also equipped with video camera surveillance and a heat monitoring system to ensure safety and provide trainees with valuable critiques of their performance. The Firefighter Training Complex features a large training field with dozens of props designed to teach a wide variety of skills including: confined space rescue, LP fire suppression, aircraft fire suppression, portable extinguisher use, three-dimensional firefighting, flammable liquids leak suppression, vehicle extrication, HAZMAT operations, overturned tractor trailer/rail car operations, structural collapse operations, high rise operations, standpipe operations, Denver drill, and many more. Two fire stations serve as the base of operations for all practical skills training courses that occur within the Firefighter Training Complex. 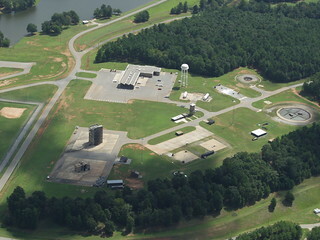 The primary source of water used for firefighter training is the 22-acre reservoir located on the GPSTC premises. Water is stored in one of two towers located on campus. The water system is engineered to provide for varying pressures and methods in pumping that are reflective of systems that exist throughout the state.